A joint press release was hold by Ningbo Municipal Government and Shanghai Railway Bureau in the morning of June 8, 2017 and Ningbo – Yuyao Intercity Railway was announced to start trial use. The first train serving on this line was scheduled to debut at Yuyao Railway Station at 10:33 am, June 10, 2017. According to the press release, trial operation starts from June 10 and ends on June 16. During these seven days, citizens and travelers are allowed to travel the train for free by applying their free trial coupons using ID card, passports and etc. With a distance of 48.7 km, Ningbo – Yuyao Intercity Railway has two stops including Ningbo Railway Station and Yuyao Railway Station. 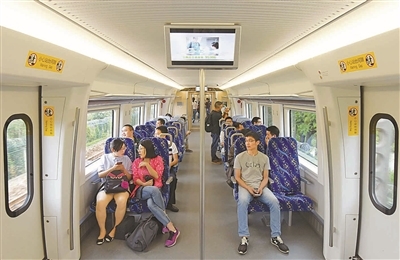 Places and attractions along the way are Zhangting, Sanqishi Town, Cicheng, Zhuangqiao and etc At present, 8 pairs, or 16 times of daily trains are assigned on the line. The first train departs Ningbo at 6:55 am, and the counterpart leaves Yuyao at 6:04 am. The train, using CRH6F Electric Multiple Unit, has a maximum speed of 160 km per hour. The free trial travel promotion has attracted huge attention so far. In the past few days, there was on average 5,000 people joined the activity on daily basis. Citizens and travellers wanting a free train travel should bring their identity certificates such as Id Cards, passports and etc and go to either the north square of Ningbo Railway Station or front square of Yuyao Railway Station to apply free travel coupons. Free Travel coupon holders will be allowed to board the train by changing the travel coupons to a magnetic stripe cards at the entrance gate. In Ningbo, they issue travel coupons during 6:20 to 9:50 and 15:30 to 19:50. In Yuyao, travel coupons are issued during 5:30 to 10:20 as well as 15:30 to 18:20. In the trail operation, each train are allowed to board 500 people maximum. Coupons are issued 30 minutes before train departure.